I have always been athletic, I started gymnastics when I was about six years old and a few years later I started playing soccer along with the gymnastics. When I stopped doing gymnastics at around 13 years old I turned to track and field. My best event in track and field was the 800m run. I ran track until I started Crossfit in 2010. I originally tried it as an alternative to the track training because of a persistent knee injury from running, but turned out quitting track altogether and starting CrossFit instead. Won 2011 Meridian Regionals with my team CrossFit Sport. In 2012 I was third at the European Regionals and went for the first time to the Games as an individual. I was fifth in 2013 at Regionals and did not qualify for the Games. Then in 2014 I went team again and won the European Regionals going for the second time with Team CrossFit Sport to the Games. Last year I was fifth at the Meridian Regionals, which meant qualifying for the Games. I placed 24th at the Games last year. This year I had my best Regional to date (again 5th) and will be going to the Games as an individual for the third time! Third time’s a charm, right? 8:30 am: Wake up and eat breakfast and then go in for my first session at 10:00 am, usually done around 12:00. Sometimes I add in a third session if I wasn’t able to finish everything on the program before coaching. I have 1-2 days off a week, typically one total rest day and another “active” rest day where I’ll swim or work some random skills. In the winter when I have school I have to kind of work around my classes and coaching schedule so I’m not always able to get in two sessions. Then I just try to make as much time to train as I can and use my time wisely. 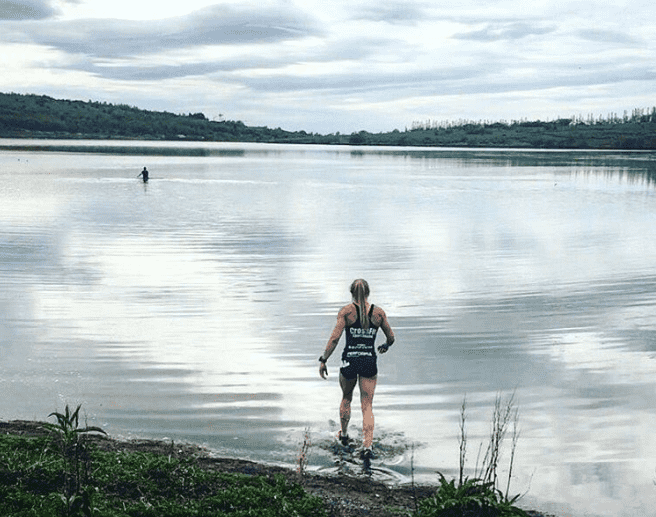 You take part in trail running, open water swimming and even practice highland games throwing events! How important is it for you to train for the unexpected in Crossfit? 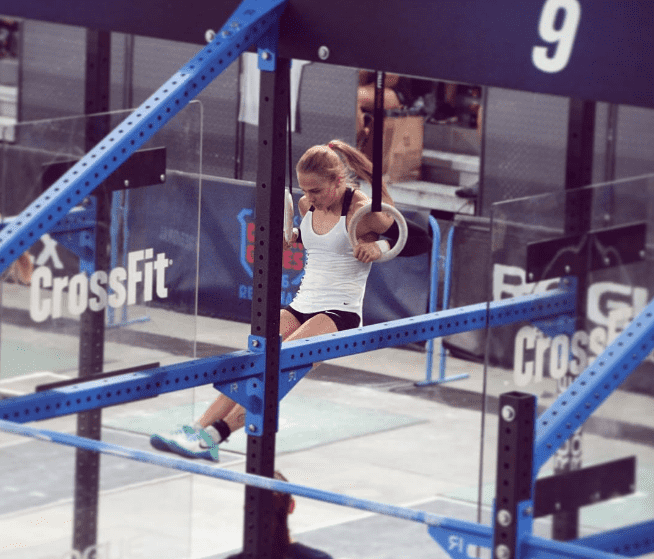 There’s not that much time to train between the CrossFit Games and Regionals. I’m trying to maintain my overall fitness while adding some more specialized skills. I feel like I can’t really improve my cardio/strength and regular Crossfit stuff for the Games that much in the short time since Regionals but I can definitely get better at other random things. It also doesn’t take up a lot of recovery, only time, which I have enough of in the summer! Heavy strongman stuff is also sort of my weakness so I’m motived to try and improve on that. In the Regionals you were one of only two girls to complete Regional Nate within the time cap which was an amazing achievement. What did you do differently from the other girls? 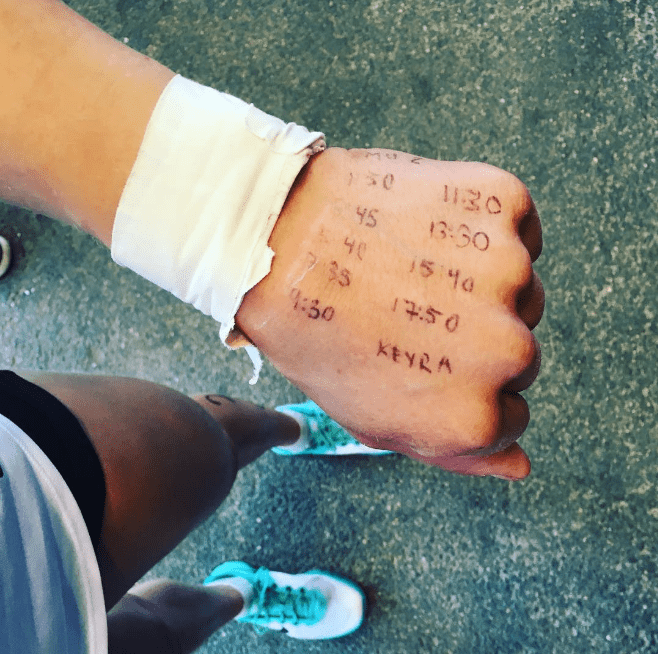 You also wrote down the times on your hand during an event at the Regionals. Where did you get the idea from? And what was the thinking behind this? I don’t know where the idea came from, I have been doing this for a while. Before Regionals we get a lot of time to practice each event so it’s easy to come up with a good strategy, which I LOVE. I also strategize and often write on my hand when I don’t have as much time to prepare. We have to ask… How did you feel after the rope climb no-rep call on Event 7? I just felt really sad and honestly really angry at the judge, I felt I had earned a first place finish in this workout and an overall podium finish. I was disappointed that my improved regionals performance from last year wouldn’t show in the rankings. I earned my moment in the spotlight running across the finish line crushing the “group of death” in that workout and was devastated after it was taken away. If I had just failed the rep and not touched I would’ve just been angry at myself but the judge was on the other side of the rig so he couldn’t clearly see me and told me when I got down that I should’ve made it more obvious. I know it isn’t easy to judge the rope climbs though and I really hope that HQ improves that soon, something simple like having the judge up on a box would make a difference. But these kind of things are bound to happen in a competition and I’m over it by now, especially because of all the support I received and the screenshots that people sent me of myself touching the rig. I feel like everyone knows that I should have won that WOD. You are a veteran of the CrossFit Games. How important is strategy during elite events such as the Regionals and the Games themselves? I think it’s very important, like I said before I feel it is necessary to have a at least an idea of a plan, even if it isn’t perfectly though out. My favorite part of competing is strategizing. You’re also a champion weightlifter. Did you get into this before you started Crossfit? Or was it the other way around? I competed in my first weightlifting comp over a year after starting CrossFit, so CrossFit came first. I liked it a lot so I soon started to compete at all the local competitions here in Iceland. Since then I have been the national champ multiple times and hold all the national records in my category, the -58 kg. I am the current Nordic champion and I went to the IWF World Championships in Houston last fall as well as the European Championships earlier this year. I usually perform my best under pressure and my PR’s are from competitions. How often do you work on your mobility and flexibility? How often should everyday Crossfitters work on theirs in your opinion? I do it for at least an hour a day and it makes all the difference in the world. I also see a physical therapist weekly as well as getting a massage every week. I’ve got to say rowing. I work on it all the time though… don’t know why I can’t seem to fix it haha! What’s it like training in the winter and summer in Iceland, with the extreme changes in daylight and temperature? You are a bit smaller than a few of the other girls, yet you still get through heavier lifting WODs with no problem, beating many other girls who are bigger than yourself. How do you program strength work into your training? 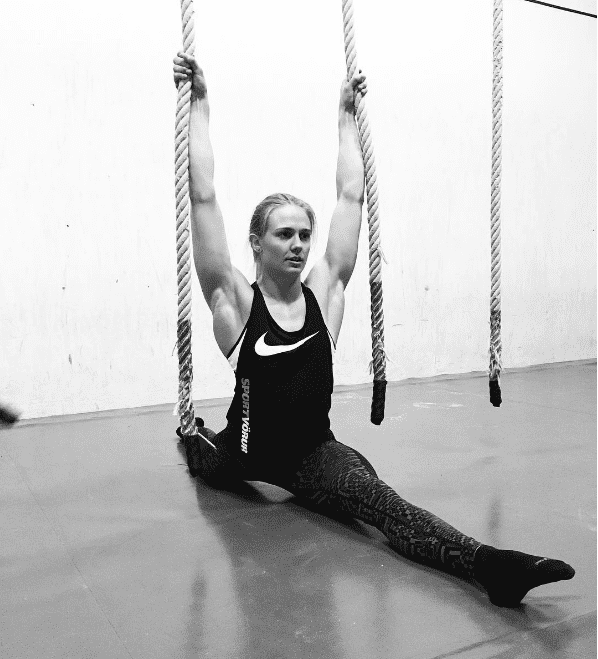 It helps a lot to be strong and muscular in CrossFit but the thing is it also has to do a lot with coordination, technique and explosiveness which is where I make up a lot of ground. I don’t have as much muscle mass but my form is very consistent and I am able to get in good positions which saves energy and makes it so I can get away with not having as much raw power. Heavy barbell stuff is not my forte though and I am constantly trying to get stronger. I mostly follow the Invictus programming by CJ Martin but also have a coach, Árni Freyr, who helps me a lot. He programmed my weightlifting before the World and European championships and he also coaches me in technique and such on a daily basis. What does your training program for the Games look like, and roughly how often do you train? It’s 2-3 sessions a day, including weightlifting, WODs, skill work and everything in between. I train like that 5 days a week, swim once a week and recover once a week. This totals to about 30 hrs a week. 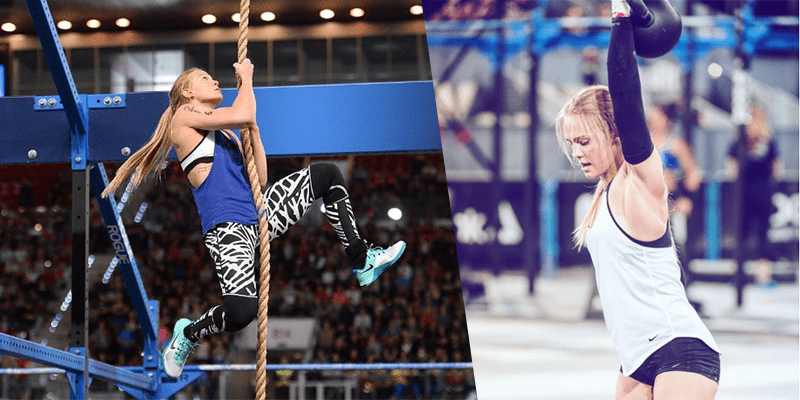 Can you give us 3 tips for crossfitters looking to improve their gymnastic skill in Crossfit? Can you tell us 3 things that are on your ‘bucket list’ of things that you would love to do before you die? I want to get at least a year where I focus just on only CrossFit (no school or anything to distract me). Other than that I would love to go skydiving, I want to go skiing (never have!!) and travel the world more! Thanks for your time Thuri Erla Helgadottir and good luck for the Games!